Amyloidosis refers to the deposition of extracellular fibril in tissues. Fibrils, composed of low molecular weight subunits (5 to 25 kD), can organize into a beta-pleated sheet configuration that can deposit in various organs and cause pathology.1 Multiple different precursor proteins have been shown to transform to a fibrillar configuration associated with amyloidosis. The kidney is the most commonly affected organ in AA amyloidosis.1 Deposition of amyloid into the glomerulus can lead to nephrotic syndrome1, leading to symptoms such as heavy proteinuria and generalized edema, which the patient in this case demonstrates. 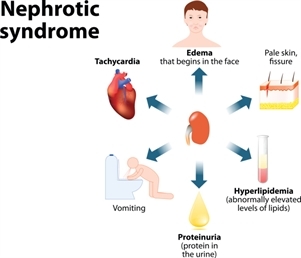 Other complications of nephrotic syndrome include hyperlipidemia and hypercoagulability.